For 60 years LSE shared Clare Market with two significant neighbours: the St Clement’s Press and the Government Laboratory. LSE Archivist Sue Donnelly investigates. The government established the Government Laboratory in 1842. 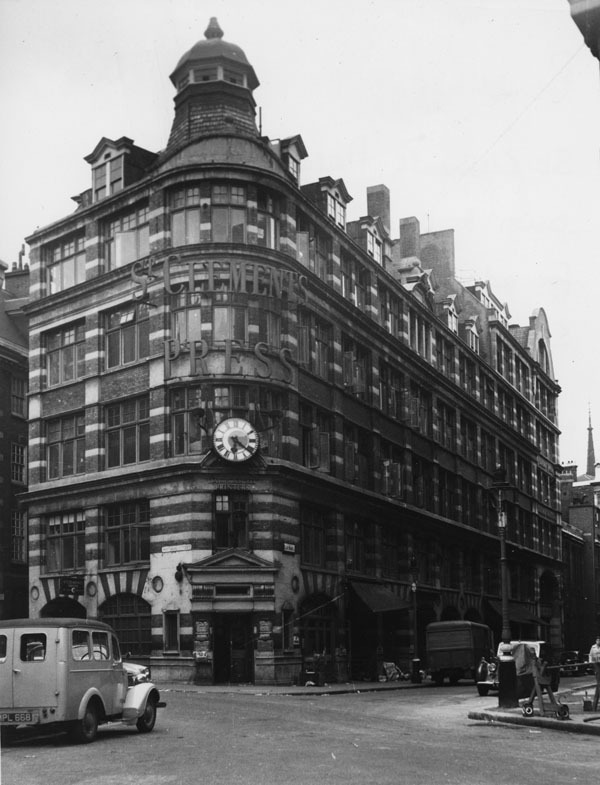 Based in the City of London the Laboratory’s initial role was guarding against the adulteration of tobacco and protecting the government’s revenue. Following the 1875 Sale of Food and Drugs Act the Laboratory’s role focussed on protecting the consumer from adulterated foodstuffs rather than protecting government revenue. In 1897 the Laboratory moved from Somerset House to the east side of Clement’s Inn Passage, to a new building designed by the Government Chemist, Sir Thomas Edward Thorpe. The new building cost £25,000 and its entrance was on the corner of Grange Court and Clement’s Inn. The main laboratory was on the first floor and was 50 feet high, 42 feet wide and 48 feet long. The Laboratory’s Annual Report declared that “The new laboratory has not only conduced to the comfort and healthier condition of the staff but also to the expediency, efficiency and economy with which the work can be conducted”. Relations with the Government Laboratory were very friendly. The Laboratory used LSE rooms and lecture theatres for events and their staff were allowed to use the refectory. In 1898 St Clement’s Press built a printing works and editorial offices on the north side of Clare Market. The building was designed by Emden, Egan and Company, who had previously worked on hotels and cinemas. The Press printed the Financial Times and from 1907 also printed Votes for Women for the Women’s Social and Political Union based in Clement’s Inn. Squeezed between the Press and the Laboratory were the small offices of St Clement Danes parish vestry until 1926 when the Press bought the offices and integrated them into the main building. There was some rivalry between the School and St Clement’s Press over the space in Houghton Street and Clare Market. For some years the Press owned the building on the corner of Houghton Street and Clare Market, crucial to the School in its plans to expand space for the Library. In 1932 the Director, William Beveridge, persuaded the press to sell the building to the School and also to make a donation towards the site’s development. By the late 1950s both the Press and the Laboratory were becoming outdated. 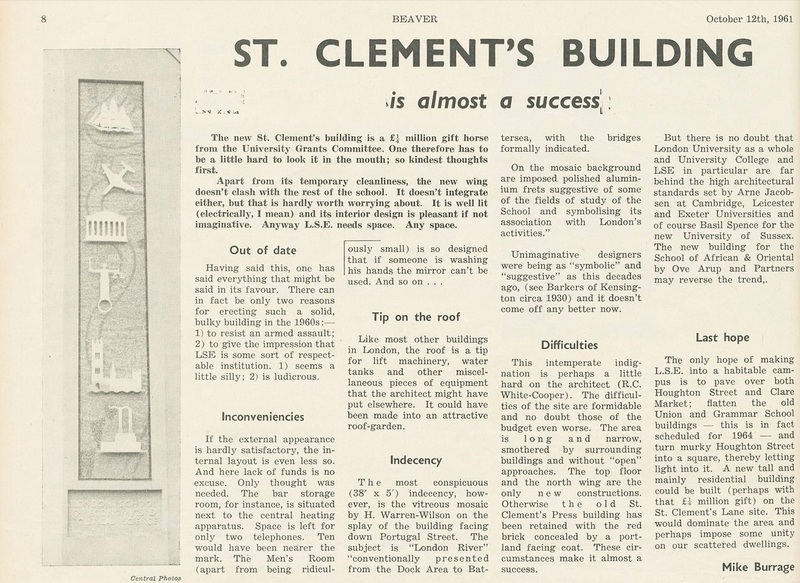 In 1955 the School acquired the lease for St Clement’s Press and in 1959 the printing works relocated to Cannon Street. With the support of the University Grants Committee the School commissioned its architect R C White-Cooper to adapt the building for School use. The building was stripped back to its frame and acquired a modern exterior. The building came into use in October 1961 when geography, statistics and psychology moved in. 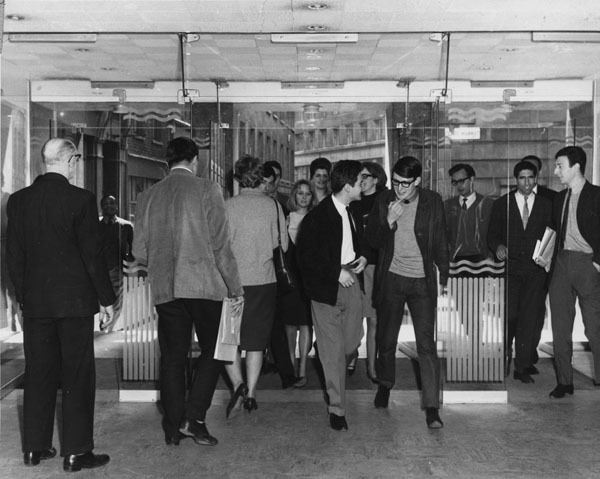 The Students’ Union occupied the basement and ground floor (apart from the area occupied by the Economists’ Bookshop) and part of the first floor. The School commissioned the stained glass artist, Harry Warren Wilson, to design two artworks for St Clement’s. He produced a set of doors decorated with etched glass illustrating various School activities represented by compass dividers, a valve, and diagrams representing geography, mathematics and statistics. The doors are no longer in use. 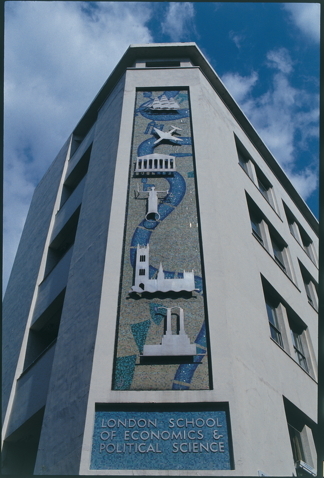 Warren Wilson also designed a mosaic decoration for the corner of St Clement’s overlooking Portugal Street which remains in situ. Warren had to cope with some detailed involvement from the subcommittee assigned to oversee the artworks but eventually produced a panel of vitreous mosaic 38 feet high and 7 feet 6 inches wide depicting the Thames from the docks to Battersea. Standing proud of the mosaic are aluminium frets suggesting fields of study of the School. Law is the figure of justice from dome of the Old Bailey, Finance the facade of the Royal Exchange, Government is the Palace of Westminster, Commerce an 18th century clipper ship, Industry is Battersea power station and Transport a plane. The mosaic did not meet with unanimous approval – indeed a motion requesting its removal was presented to Academic Board. 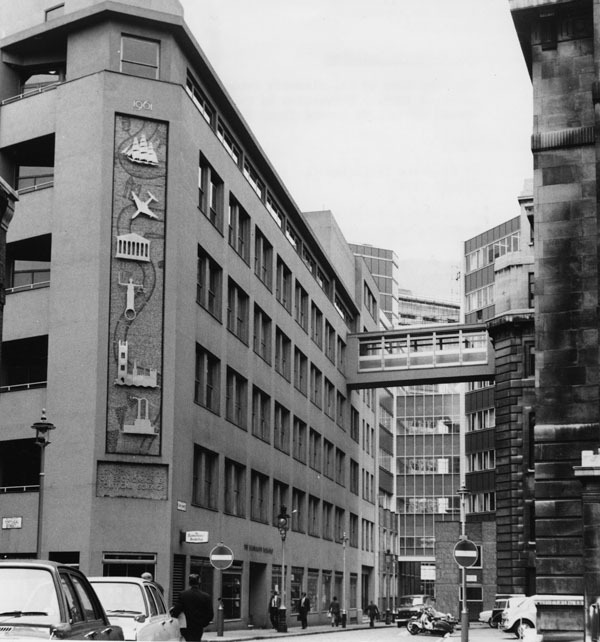 However after investigation it was decided that the cost of removal and re-placing with windows was too high so the mural remained. 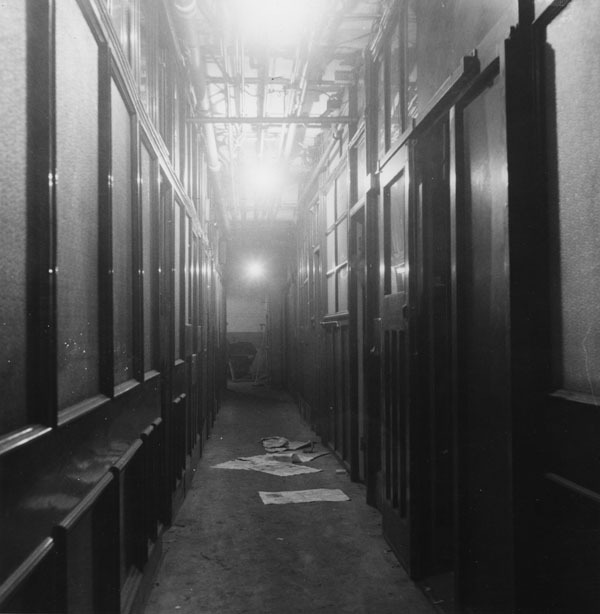 The Government Laboratory left Clement’s Inn Passage in 1959 and the St Clement’s extension was part of the 1966-1968 project which included the development of Clare Market.